The President’s budget proposal for FY2020 (Oct. 1, 2019-Sept. 30, 2020) released March 11, 2019 recommends a 10 percent reduction to overall funding for the U.S. Dept. of Education (ED), from $71 billion to $64 billion. However, the ED budget proposal recommends holding funding for special education at the amounts appropriated by Congress in FY2019. $225.6 million for National Activities (funds State Personnel Development, Technical Assistance & Dissemination, Personnel Preparation, Parent Information Centers, Educational Technology, Media, and Materials). Note: As in the previous year, the budget recommends the elimination of $17.6 million for Special Olympics, which Congress reinstated. This is one of 29 programs recommended for elimination. The Dept. of Education FY2020 budget is available here. March 26, 2019: Hearing of the House Appropriations Committee. Watch it here at 10:15 AM EDT. March 28, 2019: Hearing of the Senate Appropriations Committee.Watch it here at 10:00 AM EDT. The U.S. Dept. of Education has released new data for states on a number of aspects of children with disabilities, as required by IDEA. The new data can be found here. New this year is a report on the number and percentage of Local Education Agencies (LEAs) – commonly referred to as school districts – that each state reviewed and found to be in compliance with IDEA’s MOE requirements. More about MOE is available here. The data show LEAs to be compliant in almost all states. The U.S. Congress has finalized a bill to fund the Defense and Labor, Health and Human Services, and Education departments for Fiscal Year 2019 which begins October 1, 2018. The bill provides $71.5 billion in funding for the Education Department. Of that, $13.4 billion (18 percent) is designated for IDEA. While an increase to IDEA funds for state grants is appreciated, it doesn’t come close to the authorized amount – aka “full funding” – that we reported on recently. View your state’s IDEA funding gap using this interactive map. Federal funding for the IDEA gains little in the budget agreement reached by Congress in late April. The deal should be voted on in early May and will fund the federal government for the balance of FY 2017 (until October 1, 2017). IDEA funds for Part B Sec. 611 (ages 3-21) goes from $11.9 billion in FY 2016 to $12.0 billion in FY 2017 – an increase of .7 percent. Meanwhile, the number of students served under this program is increasing steadily – growing from 6,697,938 in 2014-2015 to 6,814,410 in 2015-2016, an increase of 1.7 percent. And keep in mind that IDEA allows local school districts to use up to 50 percent of any increase in IDEA funds to offset local spending, so students could see only half of the increase used for special education services. IDEA funds for Part B Sec. 619 (ages 3-5) stays constant at $368.2 million. IDEA funds for Part C (infants and families) also stays constant at $458.6 million. The children served under Part C increased from 350,581 in 2014-2015 to 357,715 in 2015-2016, an increase of 2 percent. Add’t special education appropriations details are here. Now we wait for the administration to release its budget request for FY 2018, due sometime in May. The “skinny” budget released in March indicated that IDEA funding would be maintained at its current rate, while the U.S. Dept. of Education faces a substantial overall decrease. Rep. Tim Walberg, R-Mich., has intro­duced the Building on Local District Flexibility in IDEA Act, H.R. 2965. The bill makes substantial changes to current maintenance of effort rules governing local educational agencies (or school districts). Below is the text of the bill. educational agencies, and for other purposes. provided by the local educational agency.''. What, exactly, is “full funding” of IDEA? The term is misleading, and, therefore, the funding “promise” made by Congress in IDEA is often misrepresented. It’s really pretty simple, however. So then, if IDEA were “fully funded,” the annual federal appropriation would be 40% of the national average per pupil expenditure – referred to as “APPE” – for elementary and secondary education times the number of children with disabilities served. To be clear, when sent off to local school districts around the country, that amount would not be 40% of the excess cost in every district – the percent would vary depending on how much each local district spends on education. The amount districts spend “per pupil” varies significantly across the nation! Source: National Education Association The Federal Funding Gap under IDEA. Chart reprinted with permission. 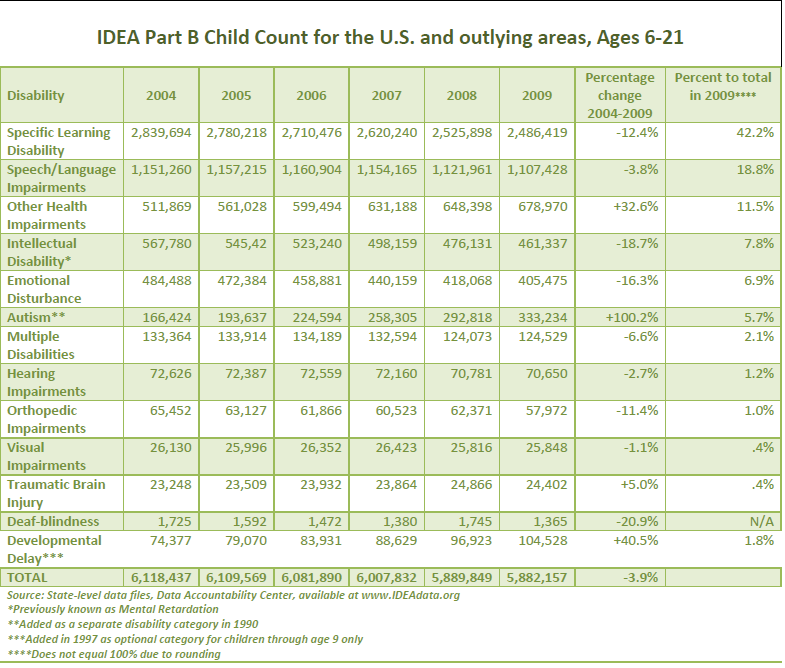 Information on the reductions to maintenance of effort (MOE), determinations of IDEA compliance and use of IDEA Part B funds for Coordinated Early Intervening Services* for the 2011-2012 school year for every local educational agency (LEA) or school district was released to the public in February 2015. States are required to report this information annually to the U.S. Dept. of Education as part of a larger data submission required under Section 618 of the IDEA. The data files are available from this website. This is a complete listing of the LEAs that reduced MOE in the 2011-2012 school year. 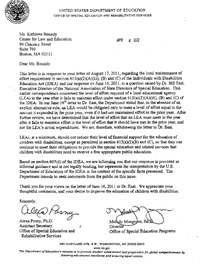 Under certain conditions, LEAs are allowed to reduce the amount spent on special education by up to 50% of an increase in federal or state and federal funds from one year to the next. The freed-up funds must be used for activities authorized under the Elementary and Secondary Education Act (ESEA). – the Amount of the MOE Reduction the LEA/ESA took under Section 613(a)(2)(C) for the reference school year. AL (9), CA (25), IN (13), KY (13), LA (4), MA (15), MO (10), NE (50), NM (56), OH (8), OK (48), PA (35), TX (12), UT (3) and WI (3). – received a “meets requirements” determination. LEAs that took an MOE reduction and DID NOT have a “meets requirements” determination are highlighted in yellow on the listing. The vast majority of these LEA are in the state of New Mexico, where 24 LEAs reduced MOE unlawfully. Some LEAs took an MOE reduction without the requisite increase in annual allocation, indicated by a (-) sign in the far right column on the listing. In Nebraska, 36 LEAs reduced MOE without having received an increase in funding. This is a complete listing of the LEAs that were required to spend 15% of Part B funds in the 2011-2012 school year due to having significant disproportionality. Disproportionality is the overrepresentation of minority or ethnic students in special education identification, placement, or disciplinary actions. In such cases, the local district must use all of the CEIS funds and must devote most but not all of the CEIS funds to serve children in the over identified group or groups. LEAs required to use 15 percent of their IDEA Part B federal funds on CEIS due to significant disproportionality may not reduce their local expenditures by any amount. – the number of students who received CEIS during the reference school year and the number of children who received CEIS at any time during the reference school year and the two preceding school years and received special education and related services during the reference school year. The following states had no LEAs identified as having significant disproportionality: AL, CA, CO, CT, HI, ID, KS, ME, MA, MN, MO, MT, NE, NV, NH, ND, OK, PA, SC, SD, TN, TX, VT, WA, WV, WY. The number of LEAs required to provide CEIS in 2011-2012 was very similar to the number required in the previous school year (2010-2011). In that year 356 LEAs were required to provide CEIS. The uneven pattern of LEAs identified as having significant disproportionality is reflective of the varied definitions states have been allowed to develop. This issue was explored in great detail in a 2013 report from the Government Accountability Office entitled “IDEA: Standards Needed to Improve Identification of Racial and Ethnic Overrepresentation in Special Education.” A new report from The Civil Rights Project, Are We Closing the School Discipline Gap?, provides extensive data that underscores the need for federal oversight and the comments submitted by the Civil Rights Project in 2014 articulate specific recommendations. This is a complete listing of the LEAs that elected to voluntarily use up to 15% of their Part B funds in the 2011-2012 school year to provide Coordinated Early Intervening Services (CEIS). – the number of students who received CEIS during the reference school year. A total of 44 states and territories had LEAs that voluntarily used Part B funds for CEIS. Across these 1243 LEAs, the amount spent totaled $109.3 million. The amount an LEA may reduce its MOE (Report One) is reduced by any amount the LEA voluntarily uses for CEIS (not to exceed 15%). AL (3), AR (33), AZ (20), BIA (71), CA (11), CT (16), DE (3), FL (16), GA (5), HI (1), IA (12), IL (198), IN (18), KS (1), LA (21), ME (22), MI (19), MN (133), MS (46), MO (7), NE (34), NV (35), NH (10), NJ (8), NM (11), NY (30), NC (9), ND (8), OH (77), OK (18), OR (14), PA (10), RI (6), SC (31), SD (13), TN (7), TX (148), UT (16), VA (8), VI (1), VT (9), WA (8), WI (86), WY (24). The number of LEAs voluntarily using Part B funds for CEIS in 2011-2012 is similar to the number in the previous year when 1265 LEAs provided CEIS voluntarily. *Coordinated Early Intervening Services are services provided to students in kindergarten through grade 12 (with a particular emphasis on students in kindergarten through grade three) who are not currently identified as needing special education or related services, but who need additional academic and behavioral supports to succeed in a general education environment. The IDEA (20 U.S.C. §1413(f)(2)) and its regulations (34 CFR §300.226(b)) identify the activities that may be included as: (1) professional development for teachers and other school staff to enable such personnel to deliver scientifically based academic and behavioral interventions, including scientifically based literacy instruction, and, where appropriate, instruction on the use of adaptive and instructional software; and (2) providing educational and behavioral evaluations, services, and supports, including scientifically based literacy instruction. To access the entire set of data, download this file. NOTE: To open this file in Excel, right click on the link, select “save link as” then select “all files” under save as. This should allow you to save the file to your computer and open in Excel. Additional information about this data collection is available in this documentation (WORD). Klein and other Republican leaders issued a formal request for a $1.5 billion increase in IDEA Part B funding in the Fiscal Year 2015 Labor, Health and Human Services, Education, and Related Agencies Appropriations Act, bringing the total funding to $13 billion. The assumption underlying the Individuals with Disabilities Education Act (IDEA) and its predecessor legislation is that, on average, the cost of educating children with disabilities is twice the average cost (measured as the national average per pupil expenditure or APPE) of educating other children. Congress determined that the federal government would pay up to 40 percent of this “excess” cost, which is referred to as full funding. Since 1981, the first year for which full funding was 40 percent of APPE, the federal share has remained less than half of the federal commitment based on regular appropriations. As a result, states and school districts are forced to absorb the additional costs not funded by the federal government to meet the needs to which these students are legally entitled. In 2014 alone this cost is almost $17.6 billion. There’s a big mess brewing in the Land of Enchantment. And it could cost the state dearly in Federal funding for the Individuals with Disabilities Education Act. State auditor Hector Balderas, following a detailed audit of the NM Education Dept. (available here), directed the education dept. to provide details on why it failed to provide adequate state funding for special education in two consecutive years, in violation of the IDEA’s “maintenance of effort” or MOE requirements. IDEA authorizes very limited waivers to the State MOE requirement. The Secretary of Education may find that a waiver is equitable due to exceptional or uncontrollable circumstances such as a natural disaster (e.g., Hurricane Katrina) or precipitous and unforeseen decline in the financial resources of the state, or the State meets the exceptionally high standards for a waiver of the supplement not supplant requirement – i.e., an SEA can establish that a free appropriate public education is provided to all eligible children with disabilities in the State. (This type of waiver has never been granted.) USED issued guidance on the process and criteria used to evaluate a request by states to waive maintenance of effort (MOE) requirements in 2009. Balderas said his office wants to find out why the department didn’t comply and why it took so long to disclose what was happening. The New Mexico Education Dept. requested a waiver (as allowed under IDEA) for two years – 2009-2010 and 2010-2011. In June 2013 the US Dept. of Ed informed New Mexico that it was granting the waiver for 2009-2010 but not for 2010-2011 hence the potential loss of funds. According to a story in the Santa Fe New Mexico paper, New Mexico has appealed the denial of the waiver for 2010-2011. Lawyers from both sides will meet in Washington, D.C., on April 8 to lay out the legal groundwork. Under sequestration, federal funding for discretionary programs – including both defense and nondefense (called nondefense discretionary or NDD) – will face more than $700 billion in cuts over the next eight years. In two years, NDD spending will equal a smaller percentage of our economy than ever before – if lawmakers do not act to replace sequestration with a more meaningful and comprehensive deficit reduction strategy. The Advocacy Institute – sponsor of IDEA Money Watch – has joined with thousands of organizations to form NDD United and to create a new report on the impact of sequestration across programs that rely on discretionary federal funding, including federal funds to support the provision of special education services as required by the Individuals with Disabilities Education Act (IDEA). is available at NDD United. Contact your members of Congress (two Senators, one House member) and tell them to put an end to sequestration and avoid any cuts to federal funds for IDEA. Use Contacting the Congress to locate the contact information for your members and send your messages. Our nation’s 6 million students with disabilities are counting on you! The Labor, HHS, Education Subcommittee of the Senate Committee on Appropriations voted Tuesday, June 12, 2012, to provide additional funding for the IDEA and other programs that go to assisting children with disabilities. The bill was approved by the full Appropriations Committee on June 14, 2012. A summary of the increases proposed in the bill is below. Education for Individuals With Disabilities (IDEA).—The bill provides $11.678 billion, an increase of $100 million, under section 611 of part B grants to States for educating students with disabilities between the age of 3 and 21. Promoting School Readiness for Minors in SSI (PROMISE).—In fiscal year 2012, Congress created PROMISE, an interagency effort to improve outcomes for children, and the families of children, receiving Supplemental Security Income (SSI) benefits. This program will encourage State-level innovations that can help young people with disabilities enter and succeed in competitive, integrated employment. The bill includes nearly $12 million and the authority to allocate unspent vocational rehabilitation State grant funds within the Department of Education for this effort, in addition to $7.2 million at SSA. Assistive Technology.—The bill provides $37.5 million, an increase of $4.7 million, for State assistive technology programs. These programs support a range of activities to serve people with disabilities, including State financing programs, device reutilization and loan programs, and device demonstrations. Sequestration was triggered when the Joint Select Committee on Deficit Reduction (aka the Super Committee) failed to reach an agreement on a ten-year, $ 1.2 trillion deficit reduction bill. It was all part of the debt ceiling agreement that Congress passed in August of 2011. Under sequestration, education funding will be subject to cuts ranging from 9.1% (in 2013) to 5.5% (in 2021). For IDEA, this means a reduction of $$1,053,600,000 in 2013. Other education programs also will get hit hard…Title I will lose $1.1 billion, $590 million for Head Start — both of these programs serve students with disabilities in addition to IDEA. A $1.1 billion reduction in IDEA federal funds in 2013 will put the federal contribution toward the cost of special education back to its 2005 level. On Tuesday the American Enterprise Institute (AEI) released “Something Has Got to Change: Rethinking Special Education,” a paper that examines special education spending and seeks to offer practical solutions to “tame out-of-control special education spending while serving special-needs students better.” AEI also provided a teleconference during which the paper’s author, Nathan Levenson, presented a brief overview and responded to questions. IDEA Money Watch: It’s rather unfair to look at special education spending pre/post the enactment of the federal special education law, now known as the Individuals with Disabilities Education Act (IDEA). The driving purpose of the law was to end the exclusion of students with disabilities from public education. A congressional investigation in 1972, following two landmark court cases (PARC v. Commonwealth of PA and Mills v. Board of Education of District of Columbia) found that of the more than 8 million children with disabilities requiring special education, only 3.9 million were receiving an appropriate education, 1.75 million were receiving no educational serves at all, and 2.5 million were receiving an inappropriate education. A contrast between either the number of students served by special education or the amount of money spent to serve them that reaches back to before enactment of federal legislation is both useless and misleading. We had to poke around to find the source of the claim that special education accounted for 21 percent of total school spending in 2005. Levenson’s paper references an Education Week blog about a conference on Improving Productivity in Public Education and, specifically, a presentation by Karen Hawley Miles of Education Resource Strategies – none of which tells us the source of the information. We do know that the U.S. Dept. of Education’s National Center for Education Statistics (NCES) does not collect data on special education spending per se. Reports issued by NCES on revenues and expenditures for public elementary and secondary education do not break out expenditures for general and special education. That leaves us reliant on surveys and special studies. One such survey from the Economic Policy Institute, Where Has the Money Been Going (October 2010), relies on data from nine school districts. The EPI report found that the average annual real growth in per-pupil spending from 1996-2005 was 4.5% for special education vs. 2.4% for regular education (Table 10). During that same period, 53% of net new money was spent on academic classroom programs while 41% was spent on special education (Table 11). In 2005, 21% of district spending in the nine districts, on average, went to special education (Table 16). This appears to be the source for the claim in Levenson’s paper. But this is not a national figure, only an average of data from nine districts, ranging from 15% to 23%. IDEA Money Watch: Actually, the number of students ages 6-21 eligible for special education services has declined every year since 2004 – down 4% between 2004 and 2009, according to data collected by the U.S. Dept. of Education. As our chart here indicates, some categories, like specific learning disabilities, which accounts for almost half of all special education students, has declined by 12.4% since 2004. This is a pretty simple fact to get right. IDEA requires an annual count of students receiving special education; it’s available at www.IDEAdata.org. Equally wrong is Levenson’s characterization of “health impairments (OHI), autism, and developmental delay as “severe disabilities.” The category of OHI is made up largely of students with Attention Deficit/Hyperactivity Disorder (ADHD), particularly since a change to federal regulations in 1999 made ADHD expressly part of the OHI category. Autism – a disability showing explosive growth nationwide – is not necessarily “severe” in all students found eligible in this category. Developmental Delay – added in 1997 – is an optional category available to states only for children through age 9. It allows young children to be served under IDEA without being assigned a specific disability designation. Fifteen states don’t use the Developmental Delay category at all (AR, CA, CO, CT, FL, IN, IA, MT, NJ, NY, OH, OR, SD, TX, and WV). So, the growth in this category is technically not growth at all, but rather a shift in how schools designate children ages 6-9 in some states. Simply put, if this category didn’t exist, students would be assigned to one of the other IDEA disability categories (as they are in those 15 states not using the category). IDEA Money Watch: Let’s not equate spending with effort. As Levenson correctly points out, students with special needs have fared poorly academically even in the best of financial times. Parents often wonder what all that money is providing their student. Sometimes we even speculate that special education costs are overstated by districts because they can use the “federal mandate” argument to defend any amount of spending. However, by any large-scale measure, students with disabilities are performing poorly despite the enormous amount of funds that schools claim to be spending. 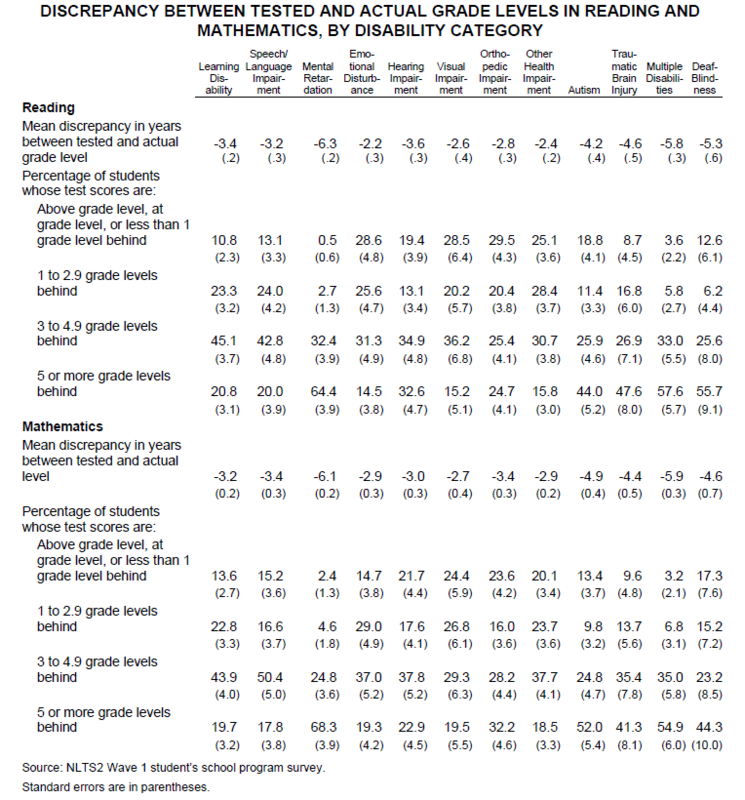 For example, on the 2009 National Assessment of Educational Progress (NAEP) only 38% of students with disabilities were at or above the ‘basic’ level (defined as partial mastery of the knowledge and skills that are fundamental for proficient work at a given grade) in 8th grade reading compared to 79% of students without disabilities (lots more about NAEP and students with disabilities). Another look at academic performance of students with disabilities is provided by the National Longitudinal Transition Study 2. This large-scale study found that significant numbers of students in all disability categories function far below grade level in reading and math (details here), raising serious questions about how these students can master high school course requirements to earn a regular diploma. The NLTS2 also found that the correlation between grades and academic functioning is nearly zero – indicating that students and parents are being seriously mislead with regard to real academic achievement. Yet we also know that despite the money supposedly being spent, many students with disabilities aren’t receiving the support and specialized instruction that is needed to ensure their success. This is particularly true in the area of assistive technology (AT). Anecdotal evidence suggests that only 3-5% of students with disabilities have assistive technology written on the IEP despite the IDEA requirement that the need for AT be considered as part of the development of every student’s IEP. This problem is so acute that the U.S. Dept. of Education put funding of AT at the top of its list of suggested ways that district might spend the extra IDEA funds provided by the Recovery Act. Levenson asserts that ”to raise the achievement of students with special needs, only three things matter—reading, reading, and reading” to which we respond – yes, yes, yes. Reading failure is the reason many students land in special education. Sadly, once there, many remain serious underachievers in this critical skill despite the “specially designed instruction” they are entitled to receive (evidenced by the NLTS2 finding mentioned above). As Levenson points out, the key elements of reading instruction, as identified by the National Reading Panel, are rarely followed. Worse yet, a 2006 study by the National Council on Teacher Quality found that only 11 out of 72 education schools (15 percent) surveyed were found to actually teach all the components of the science of reading. Bottom line: the majority of teachers aren’t being taught the essential components of reading discovered through millions of dollars in federal research. Yet, as Dr. Louisa Moats pointed out in a 1999 report for the American Federation of Teachers, the difficulty of teaching reading has been underestimated: it is, in fact, rocket science! Worse yet (and this is a BIGGIE for us! ), the academic achievement of students with disabilities plays no role in the monitoring and compliance activities of the U.S. Dept. of Education’s Office of Special Education Programs (OSEP). To our dismay, we found that the “performance” indicators of the State Performance Plans are not part of the annual determination of a state’s implementation of IDEA, and, in turn, the states don’t consider the performance of students with disabilities in determining the rating of its local school districts. We’ve challenged the department’s legal authority in this area and consider it a significant barrier to raising the academic achievement of students with disabilities. OSEP’s current approach to monitoring ensures a complete focus on paper compliance and ignores academic achievement. Still, improving teacher effectiveness was also a top recommendation for use of IDEA Recovery Act funds. In its guidance, U.S. ED states “Given that most students with disabilities are in the regular classroom and are taught by general education teachers most of the day, recruiting highly qualified general education teachers and providing ongoing professional development for general classroom teachers to ensure they have the knowledge and skills to teach these students effectively, as well as equipping special education teachers with core academic content knowledge, is essential.” The extent to which IDEA Recovery Act funds have been used to this end is hard to determine. We remind Levenson that the Highly Qualified Teacher provisions dealing with special educators are found in IDEA, not NCLB. In fact, IDEA requires that special education teachers who teach multiple subjects exclusively to children with disabilities demonstrate competence in all the academic subjects in which they teach. Whether this is happening in practice is another issue, we quickly admit. While not mentioned in Levenson’s paper, the Recovery Act has pumped $11.3 billion into special education between 2009 and 2011. Intended to improve results for students with disabilities, Recovery Act funds are well on the way to being totally expended – as of June 10, 2011, more than $9 billion has been obligated. Some districts have used Recovery Act funds to study the efficiencies of special education spending. Others have elected to simply hire additional staff that now must be cut as the Recovery Act funds run out. Levenson’s descriptions of increased achievement in a few districts clearly show that leaders at the local level can change what’s being done without changes in federal laws. Sadly, few actually take on the challenge. The IDEA Part B Grants to States federal funding for FY 2011 dodged a bullet last week. When the final “Continuing Resolution (CR)” was hammered out in the U.S. Congress (the one that prevented the dreaded government shutdown), IDEA funding remained mainly in tact – providing essentially the same level of funding for FY 2011 as FY 2010 – $11.5 billion (a slight reduction of $23 million resulting from a .2% across-the-board cut)*. So, should we be grateful for not being slashed, despite the fact that the initial proposal (H.R. 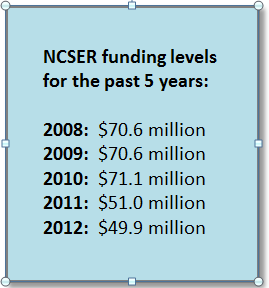 1, which we reported in an earlier blog post) contained a reduction of $557.7 million for IDEA grants to states? Remember, we dodged that bullet only by the good graces of Representative Cathy McMorris Rodgers (R, Washington 5th), who offered an amendment to restore the IDEA funding cut. And, the final amount for FY 2011 still leaves a IDEA “funding gap” the size of Texas – the difference between what is promised in IDEA (called “full funding”, explained in this blog post) and what is actually appropriated by Congress (see chart below). The President submits a proposed budget to Congress. That happened back in February. The proposed budget requests $200 million more for federal funding of the IDEA – a meager increase in the face of a funding shortfall that measures some $15 billion. The Budget Committees of the House and the Senate release a budget resolution. Once complete, the budget resolutions go to the House and Senate floors, where they can be amended (by a majority vote). A House-Senate conference then resolves any differences, and a conference report is passed by both houses. The Appropriations Committees of the House and the Senate divvy up the amount specified in the Budget Resolution to produce Appropriations bills laying out the funding across agencies. Technically, all of this is suppose to happen by the time the fiscal year begins on October 1, 2011. If not, more CRs will be required to keep the government up and running. What does all of this mean for supporters of IDEA federal funding to help local school districts provide special education and related services to students with disabilities? If the President’s budget request is the high-water mark for IDEA funding in FY 2012 – which it is likely to be – than the funding gap will persist. 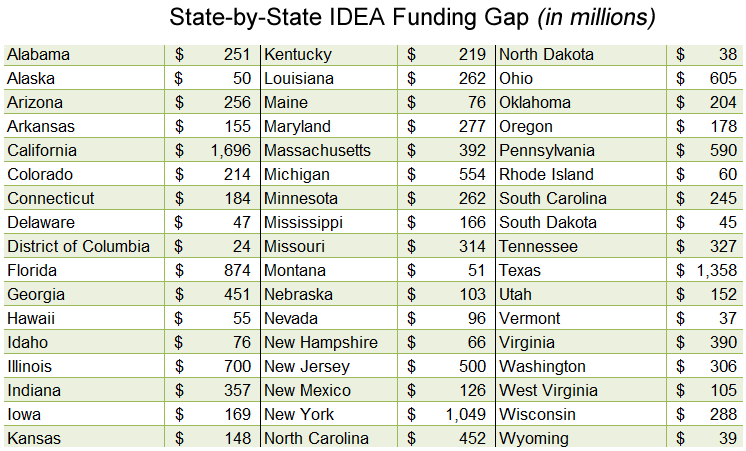 An estimated amount of the funding gap for each state (based on the FY 2010 level of Federal funding) – appears below. *A listing of all education programs impacted by the final FY 2011 CR is available here.